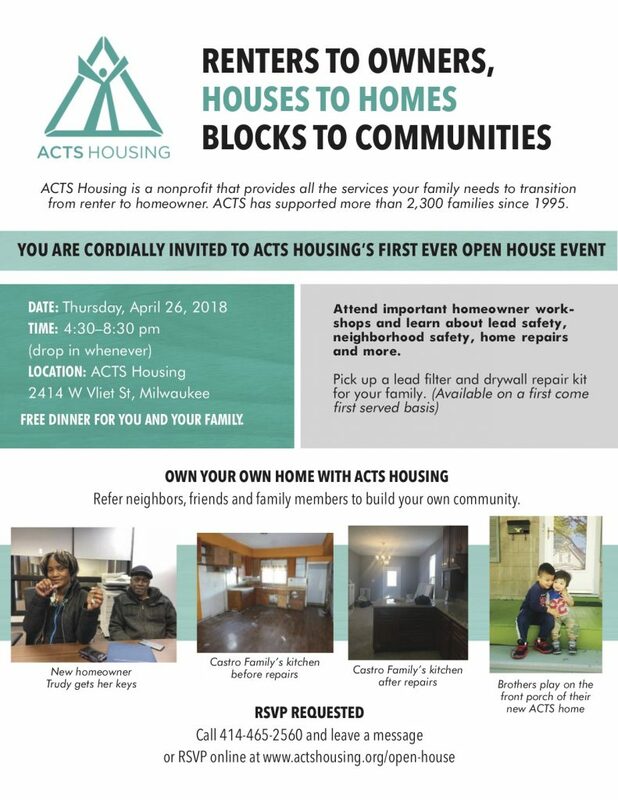 At least 150 individuals determined to become homeowners are expected to convene at ACTS Housing’s office, 2414 W. Vliet St., on Thursday, April 26, 2018 for the organization’s first-ever Open House event. The Open House will re-engage homeowners who have gone through the ACTS homebuying process and seek to engage new homebuyers through its existing homeowner base and the Milwaukee community at-large. The evening will feature drop-in workshops on topics such as: buying and selling a home with ACTS realtors, a home repair demonstration, and family protection from lead. The overall goal of the evening is to raise awareness about ways people can own their own homes and to provide educational workshops on topics that may be of interest to those who already own. The organization is giving away free lead water filters while supplies last. A dinner will be served. ACTS Housing Executive Director Michael Gosman is optimistic. The Open House comes on the heels of the launch of the Princeton University Eviction Lab and its ranking of Southeast Wisconsin’s eviction rates as being the highest in the state. ACTS Housing offers an affordable alternative to the rental and eviction crisis. Prospective attendees can RSVP for the event on ACTS Housing’s website at www.actshousing.org/open-house or by calling 414-465-2560 and leaving a message. This event is free and open to the public.